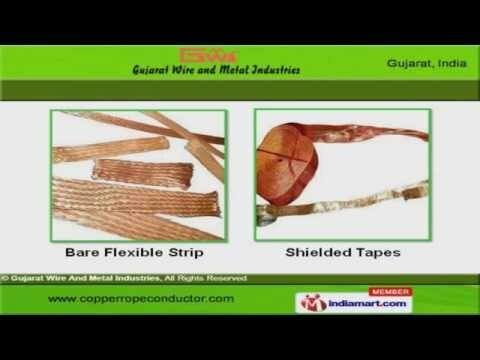 Welcome to Gujarat Wire & Metal Industries Manufacturer & Exporter of Copper Wire Products. An ISO 9001:2008 & 9001: 2000 certified company, incepted in 1972, at Surat. We Serve to Power Station, Railways, Electrical Transformers & other sectors. Modern R&D wing, sophisticated technical support & Time delivery schedule are the plus points of our organization. Our product list covers Copper Connectors, Wires & Bunched Copper Wires. We offer Copper Connectors that are acknowledged for their Optimum flexibility and conductivity. Bare Flexible Strips & Shielded Tapes offered by us are a class apart. Our renowned clients can avail from us superior quality range of Copper Wires. We also provide Silver Tinned Platted Copper Wire, Copper Wire Strips & Ropes. Along with that we offer Bunched Copper Wires that are well known for their impeccable performance.